Express Train Classic Wind Up Toy 13"
Home / Express Train Classic Wind Up Toy 13"
This handsome train features red, white and grey litho on its three cars. The train's platform is black plastic and the body is all tin with a built-in key. 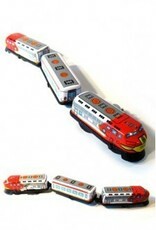 This Classic Tin Train is a reproduction of Japanese tin toys of the 1950's. Package: 1960's Era Color Box "Wind-up Express Train"